This Medallon Azul Cene Mexican tile has been made throughout many generations of artisans in Mexico, this designs express the colorful atmosphere of the Mexican culture and traditions. By decorating your house with this Mexican tiles designs you will be able to get an environment of happiness and exquisite taste. By selecting this Mexican tiles, you are not getting the tiles only, you are getting an entire culture and traditions that will allow you to get a beautiful decoration. 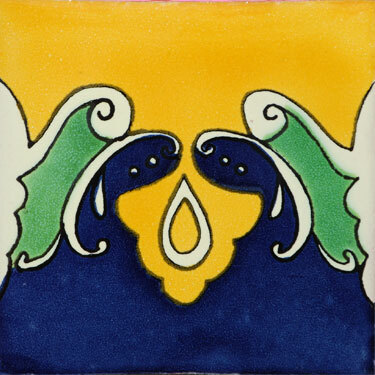 We count with a great variety of patterned Mexican ceramic tiles. Mexican tiles can also be used in wall bathrooms, floor inserts, tabletops, you can created an atmosphere of rustic style using our Mexican traditional handmade tiles.